If art reigns supreme anywhere in Spain, it is without a doubt in Cádiz. It is the home to singers, guitarists, poets and any kind of artistic genius, felt in the province of Cádiz merely by walking through its streets. Today we visit Zahara de los Atunes, 60km from the capital, Cádiz, and very near to the spectacular beaches of Bolonia-Tarifa, where the “El Malagueño” ice cream parlour is found. This establishment is proof that the genius of Cádiz can dazzle us in any of its areas, and was created by Velvet Projects. 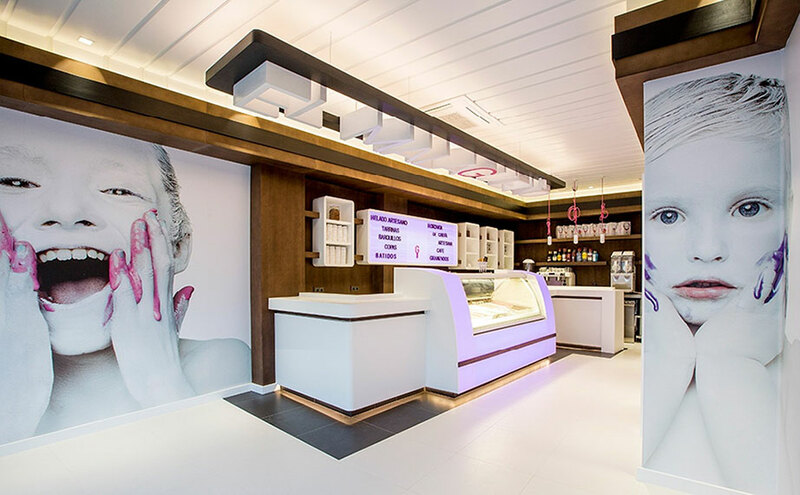 The Velvet Projects studio has been in charge of the refreshing design of the “El Malagueño” ice cream parlour, where they have achieved a hypnotic magnetism which invites us to take a break on our way and refresh ourselves with their speciality, traditional ice creams. PORCELANOSA Group has participated in this elegant Project with the compact mineral KRION®, and the porcelain of Urbatek on its floor and walls. We can find KRION® on the bar and counterbar in its 1100 Snow White colour, and in the 4102 Extreme Light colour on the translucent side. KRION® is ideal for this type of facility, not only for its appearance and possibilities, as it has intrinsic properties such as easy cleaning, being reparable, having unnoticeable joins, being antibacterial (without additives), having low thermal conductivity, and a long list of other features which make it a material to consider for any kind of project.